"Let's Make the Juanita Neighborhoods Better Together"
We receive great funding support from the City of Kirkland and utilize various grants as we are able to promote and complete many projects- but it isn't always enough to do *everything* we wish we could. If you have an idea for building neighborhood community, please let us know! Also, we have many ways you can volunteer in our neighborhood! We are always looking for volunteers for JNA Board Members and Committee Chairs! 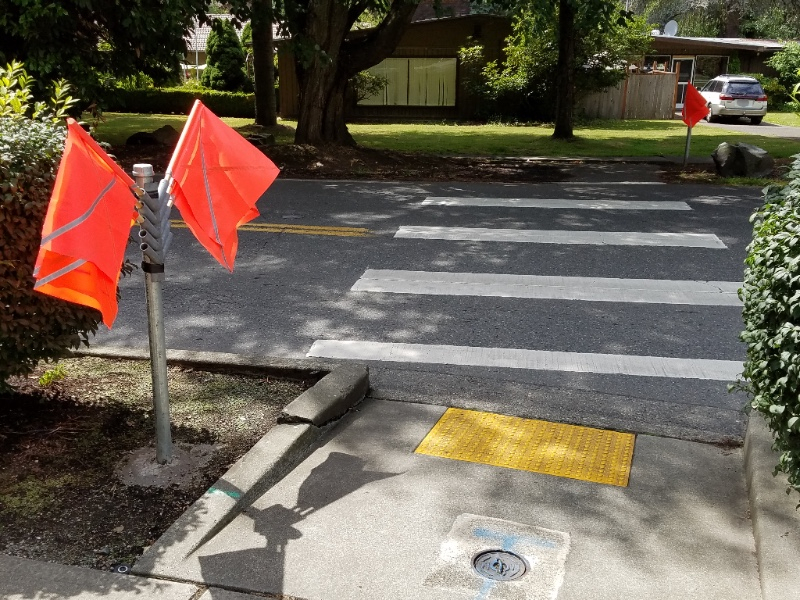 Pedestrian Flags added to the Crosswalk on 97th AVE NE near NE 120th ST by the Senior Center on the west side of Juanita Village. The City’s Neighborhood Safety Program (NSP) is accepting ideas for projects that will improve the safety and livability in neighborhoods throughout the City. Kirkland residents are encouraged to submit their ideas through the Capital Improvement Projects “Suggest-a-Project” database which is found on the City of Kirkland website. Projects submitted through September, will be considered for the next funding cycle. The NSP funds projects under $50,000, but all ideas are welcomed. The City reviews and responds to all suggestions and will notify those submitting projects if they meet the NSP parameters. All suggestions will be shared with the respective Neighborhood Associations and posted on the City’s web site. Please let us know if you have a project idea that you would like the JNA to consider! Every year, a team of volunteers install festive Holiday Lighting on the lampposts at Juanita Village. The lights go up around the Thanksgiving Holiday and come down around February. The festive Holiday Lighting is enjoyed by many during the winter months when darkness arrives earlier in the evening and more people are out and about enjoying the Holiday atmosphere.